This Web site was created to help you identify the many wildflowers that grow at Twin Swamps Nature Preserve, which is in the southwest tip of Indiana, where the Wabash River flows into the Ohio. Twin Swamps was established in 1987 by Indiana's Department of Natural Resources to help save the state's dwindling population of bald cypress trees. 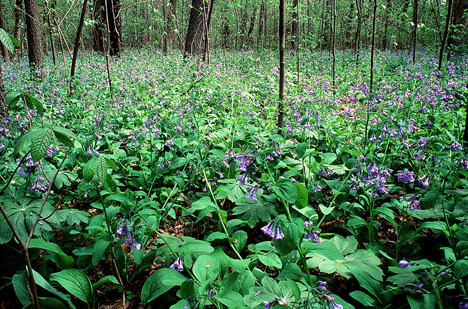 The 500-acre site is home to a wide variety of plants, including the large spread of Virginia bluebells shown here. Thumbnail photos of more than a hundred types of wildflowers at Twin Swamps will be found on the Web pages listed below. Please click on the thumbnails to see full-sized pictures and information on the flowers. To help you find specific flowers, the pictures are organized by season, by habitat and by color. Twin Swamps is a quiet and wild place, a place of remarkable diversity that contrasts sharply with the order and monotony of the surrounding fields of corn and soybean and sorghum. It�s a place that has been given over to the plants and insects and birds, a place where we can watch in minute detail as nature recycles itself, as things grow and die and decay and replenish the soil and are born again. and the Indiana Academy of Science. and may not be copied or used without his permission.